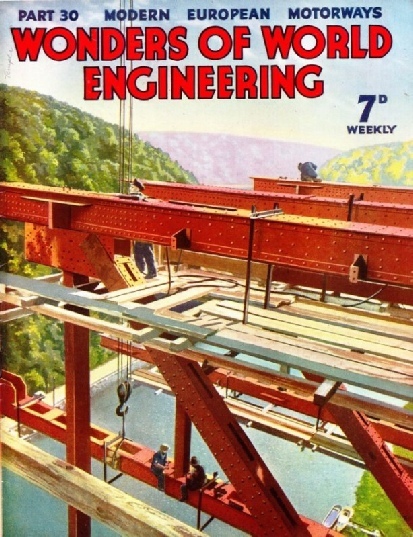 Part 30 of Wonders of World Engineering was published on Tuesday 21st September 1937, price 7d. Part 30 includes a photogravure supplement showing the motorways of Germany, which illustrates the article on the Motorways of Germany. This week’s cover is reproduced as a photogravure illustration to the chapter entitled “Motorways of Germany”. The picture shows the erection of steel girders for the bridge which carries one of these great new roads across the River Werra. The story of the canal between the port of Marseilles and the River Rhone, and the construction of a tunnel four and a half miles long driven beneath a range of rocky heights. This chapter is by C Hamilton Ellis and is the eighth article in the series Below the Surface. The article is concluded from part 29. From the thousands of tons of shale which are mined and reported in Scotland every year, numerous products are extracted, including such valuable commodities as motor spirit, naptha, paraffin wax and ammonium sulphate. Shale is mined in the same way as coal. This chapter is by Howard Barry. ACROSS THE RIVER WERRA, near Eisenach, in central Germany, a high steel-girder bridge carries the Autobahn. 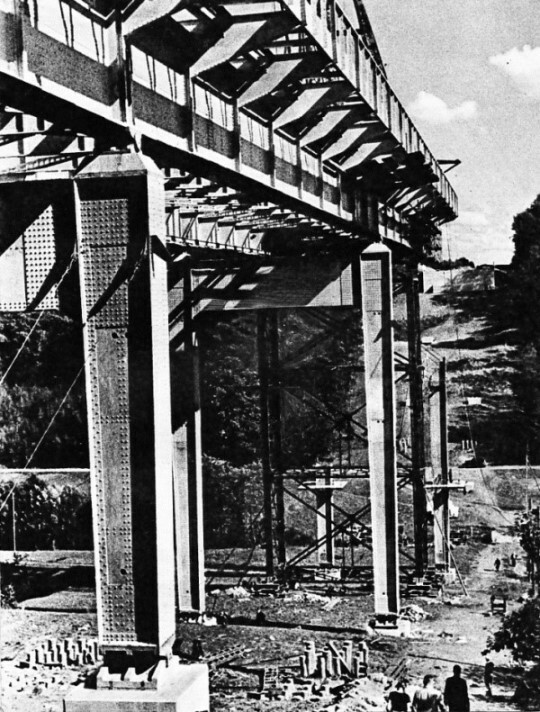 The photograph shows one of the massive girders being placed in position. This illustration was reproduced in colour for the cover of this part. THE REFINERY at Pumpherston, Midlothian, deals with all the oil produced from Scottish shale. Crude oil and light spirit from the retorts are discharged into storage tanks on arrival at Pumpherston. From these tanks the oil passes through stills which extract various products in successive stages. Motor spirit is distilled under pressure in fractioning columns. 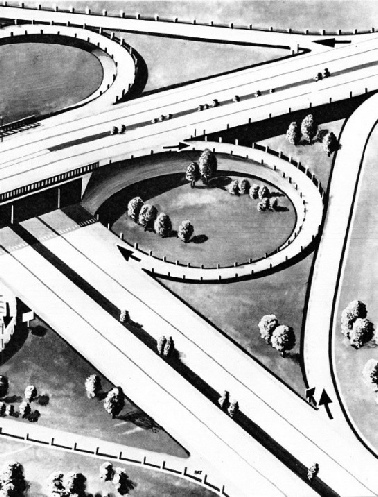 FOUR-WAYS INTERSECTIONS on the German Autobahn system have been designed so that no two streams of traffic have to meet or cross at any point on the same plane. The drawing shows a typical intersection. The direct east-west route is carried over the north-south route by a viaduct. From the approaches to the viaduct, spur roads lead down to join the north-south route. Traffic in Germany travels on the right-hand side of the highway, so that these spur roads provide only for right-hand turns. When it is desired to turn to the left, vehicles on, say, the north-south road pass under the elevated road, then turn right into a curved spur road which leads round, through three-quarters of a circle, up to the east-west road; the vehicles thus join the new route in the same direction as the east-west or west-east traffic. Similar curved spur roads are provided for traffic on the east-west route which desires to make a left-hand turn on to the lower, or north-south route. Nearly 1,000 miles of great new express motorways, or Autobahnen, as they are called, have in recent years been built in Germany. 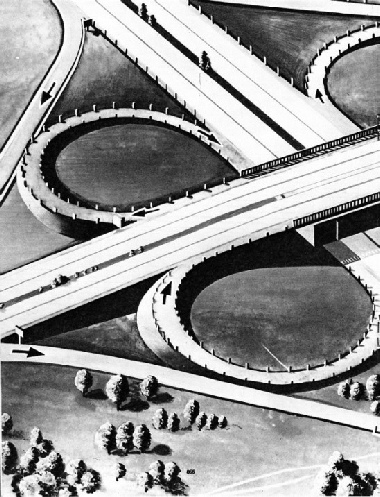 Ingenious flying and burrowing junctions have been built to assist the flow of traffic. This chapter, by Dr Karl Kruger, of Berlin, describes how the great German motorways are changing the face of the land. The scheme involves many major engineering works, such as the building of bridges and viaducts, the excavation of cuttings and the making of embankments. 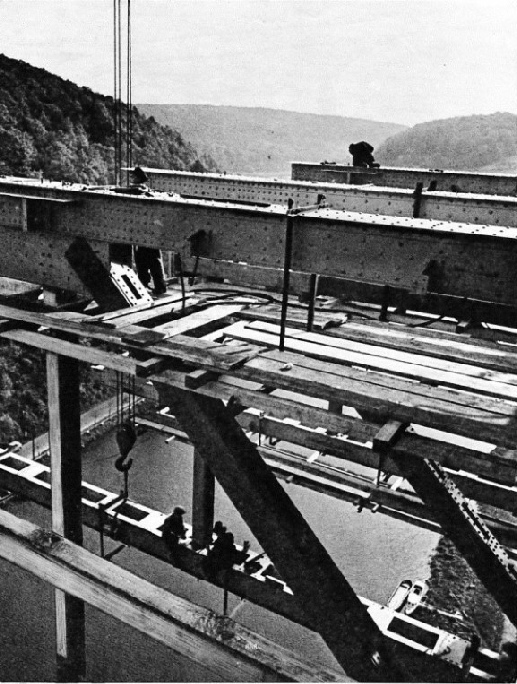 BRIDGE-BUILDING for the new motorways of Germany has given employment to thousands of men in steelworks and associated industries. The new roads have involved the building of numerous bridges and viaducts across rivers and valleys. Where possible the natural stone of the district has been used for bridges and masonry piers so that they will harmonize with the scenery. THE ROVE TUNNEL is a little over four and a half miles long. 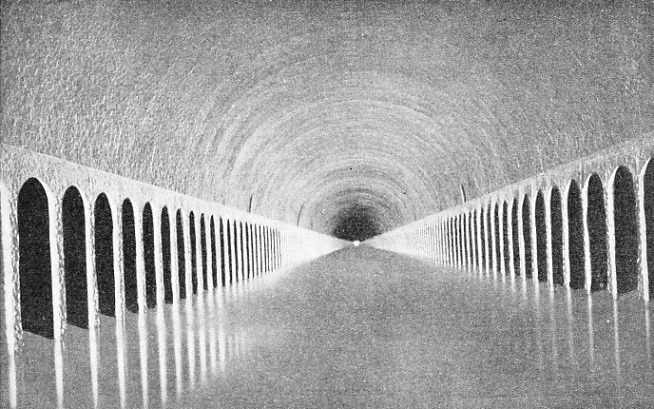 The tunnel is 72 ft 2 in wide and 50 ft 6 in high from invert to crown. Where the tunnel lining needed extra thickness the towpaths were built on the top of masonry piers spaced at 7 feet or 8 feet apart. Altogether the tunnel involved the removal of 8,830,000,000 cubic feet of rock. 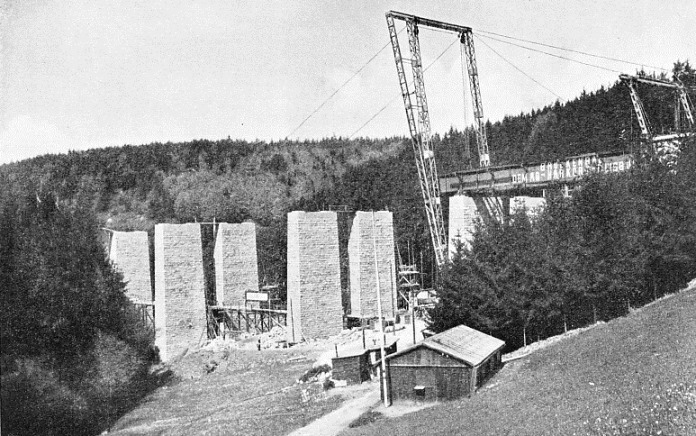 MASSIVE STEEL GIRDERS carry the dual carriageways of the German Autobahnen across valleys and low-lying country, to eliminate detours and to afford more direct routes for long-distance motor transport. It is calculated that the the cost of these bridges and viaducts is amply covered by the saving of fuel which would otherwise be wasted by deviations from the direct route. From the early and comparatively simple types of steam generator such as that invented by Trevithick have developed the enormous boilers of to-day, which vary considerably in principle and which are all-important to the engineer on land and sea. It is not generally realized how much we of the twentieth century owe to the engineers and the inventors of the nineteenth century. They devoted their lives to experiment and to research. Their inventive genius produced the elements of modern engineering practice. In this period of a hundred years these original inventions have been developed to the high standard which we know to-day. In certain spheres of engineering this trend of invention and its subsequent development are particularly marked, and these will be covered in a new series entitled Invention and Development. The first chapter in this new series is written by C Hamilton Ellis. This chapter describes how the numerous types of boiler in use to-day have developed on the principles outlined by such inventors as Trevithick and James Watt. This chapter begins the new series because many readers have written and suggested a chapter which would carefully explain the principle of the various types of marine and land boilers in use to-day. If you are interested in reading more about marine engines, there is a useful series of articles that appeared in Shipping Wonders of the World. Few owners of bicycles are probably aware that the plating of a bicycle’s bright parts may have involved the use of machines perhaps 100 feet in length and having elaborate automatic handling mechanisms. Were it not for the ingenuity of the engineer in designing such apparatus the plating of the parts, and of countless articles of domestic use, would be extremely costly. 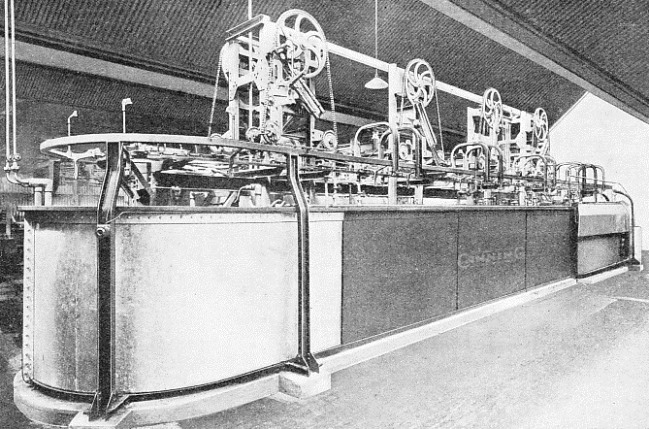 The photograph below shows a chromium-plating machine of comparatively small size. The lower portion of the machine consists of a series of tanks through which the parts are successively passed; the mechanism at the top is for automatically traversing them and for lifting them from one tank and lowering them into the next. The process of electro-deposition is, briefly, as follows. The part to be plated is hung in a solution of the metal which is to be deposited and is connected with the negative pole of the current supply, the part itself forming the cathode. The positive pole may be of various materials and is called the anode. When the current is switched on, the circuit is completed through the solution, the “flow” being from anode to cathode. The metal in the solution is separated out and is deposited on the part. The row of tanks comprising a nickel-plating machine begins with one containing a hot cleaning solution which is agitated by jets of compressed air, an electric current being passed through it at the same time. The dirt rises to the top of the tank in the form of a scum which is blown away by a jet of compressed air and drained off. The parts are hung on frames which are automatically traversed through the tanks and in and out of them. The next tank is a lead-lined one containing clean cold water, also air-agitated, and having a waste overflow. A spray of clean water at the surface completes the swilling operation as the parts leave the tank. Next comes a cyanide tank in which the parts are kept for a short time to remove any oxides which may have formed on them in the first tank. A second cold water swill follows and after that comes a dip into a weak acid solution to neutralize any cyanide which may have escaped the swill. Another cold swill follows the acid bath and then the parts are transferred to the nickel-plating bath. This bath is lead-lined and the anodes are, nowadays, of depolarized nickel. The parts are then washed and loaded on to the suspender frames of the chromium-plating machine. These frames are coupled to the negative pole of the current supply and are first taken round the plating vat, which is of iron lined with a special hard lead and, inside that, with reinforced glass sheets. This tank is heated by a water jacket and the fumes from it are drawn away by a fan. After the chromium plating has been finished the parts are given a cold swill to remove the chromic acid, then passed to another tank in which any remaining acid is neutralized. A cold and a hot swill complete the process. This is the eighteenth article in the series on Modern Engineering Practice. 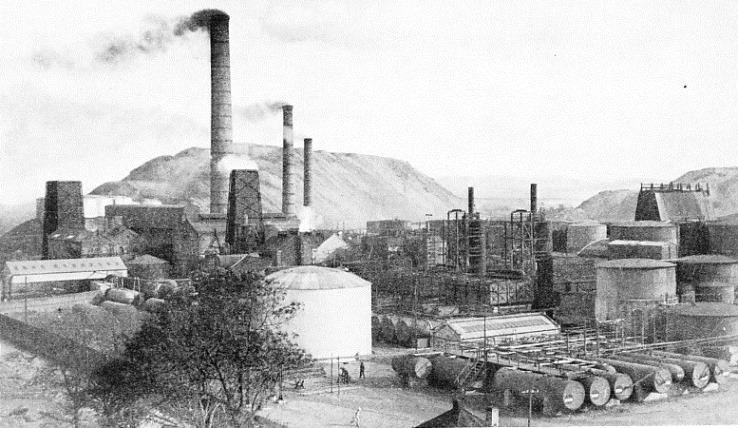 THE LANCASHIRE BOILER is a type commonly used for supplying steam to engines in factories in Great Britain. 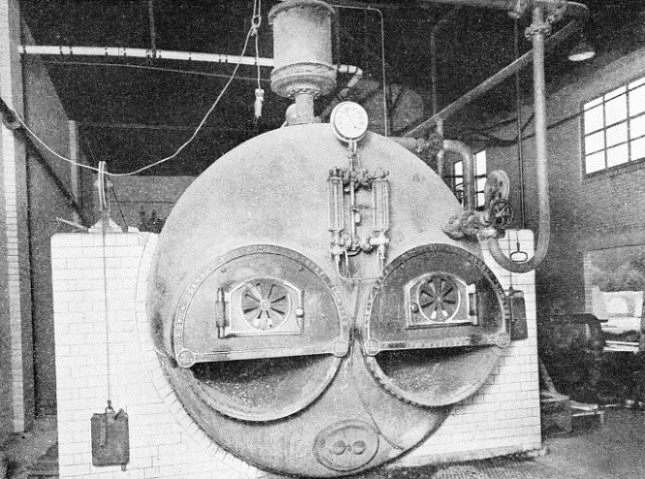 The Lancashire boiler is similar to the Cornish boiler, but has tow parallel flues, generally containing cross water tubes. Steam is taken either from the top of the boiler shell or from a dome or steam drum mounted on the top. 16 ft 6 in wide. Each track is 24 ft 6 in wide. The roads are designed for speed, so there are no level crossings or ordinary intersections, and corners are banked. 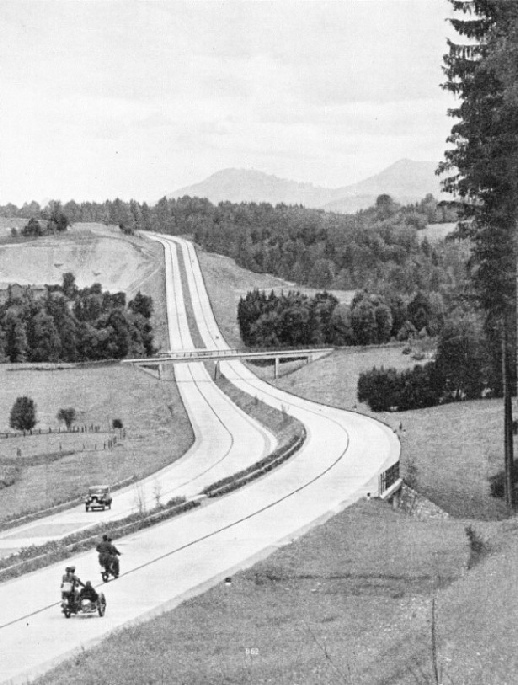 The photograph shows a portion of the motorway between Munich and Berchtesgaden, in South Germany, on the Austrian frontier. MODERN WATER TUBE BOILER of Canadian manufacture, capable of producing 80,000 lb of steam an hour. The top superheater drum A takes steam from the drum B; this steam passes round the hairpin-shaped tubes and back to the bottom superheater drum, thence to the engines. The boiler is fired by oil through the burners C. The furnace is lined with water tubes D. The hot gases flow over the front nest of tubes, across the baffle E, over the superheater tubes and over the back nest of tubes F, to the flue outlet. The water drum is at G. All the boiler tubes are connected at one end to this drum and at the other to the drum B in which the water level is about half-way up. The casing is of steel with a refractory lining. The first telephone line across America was opened by Graham Bell, the inventor of the telephone, in 1915, when he conversed with San Francisco from New York. Engineers had to carry the pioneer lines over prairie, desert, swamp and mountain ranges. One of the great landmarks in the history of the telephone was the building of the first transcontinental telephone line, between new York and San Francisco, a distance of about 3,400 miles. Thirty-nine years after his first telephone conversation, Graham Bell, the inventor of the telephone, spoke in 1915 to his assistant on the other side of the American continent. The builders of the line suffered great hardships as they forced their way across prairie, desert, mountain ranges and swamps. In this chapter, Harold Shepstone tells the story of these pioneers of the telephone. The article is concluded in part 31. 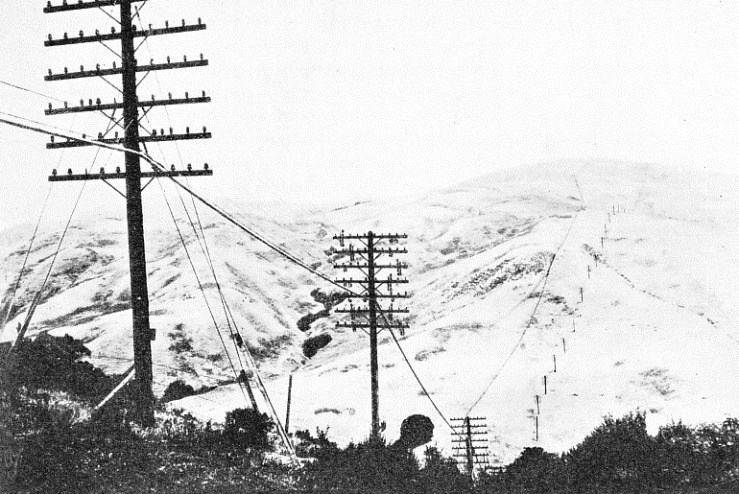 ACROSS THE MOUNTAINS between San Francisco and Sacramento, in California, the steepness of the grades presented serious problems to the engineers who built the first transcontinental telephone line. In these regions they suffered severe hardships from the wintry conditions.